New York: Serena Williams returned to the US Open with a fairly routine win, overcoming early minor struggles to outclass her opponent, No. 68 Magda Linette of Poland, 6-4, 6-0, in her first match in Arthur Ashe Stadium since 2016. Much changed for Williams after that tournament two years ago. Five months later, she won the Australian Open for her 23rd Grand Slam title, the most in the Open Era, and then in September gave birth to her daughter, Alexis Olympia Ohanian. One of seven mothers in this year’s draw, Williams said she was particularly emotional on Monday, not because she was back at the tournament she has won six times, but because she was unable to say goodbye to her daughter, who was napping at the hotel when Williams had to leave for work. “It kind of broke my spirit,” she said, eliciting a sympathetic “Aww” from the fans in the stadium. 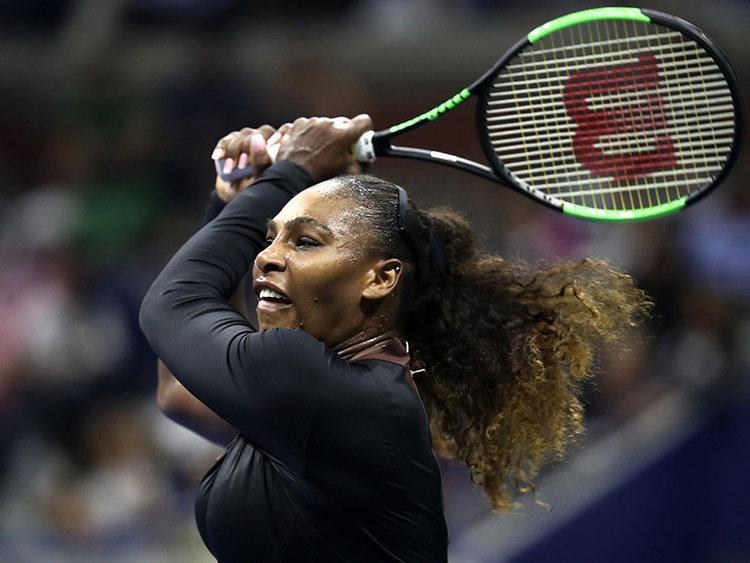 But Williams, 36, showed plenty of spirit on the court, yelling and pumping her fists at a few key junctures in the match, and she smiled afterward as she told the fans how meaningful it was for her to feel the electricity of the New York crowd after a year away. “It’s really one of the best feelings in the world,” she said. Williams’ second-round opponent is Carina Witthoft of Germany, who beat American Caroline Dolehide, 6-3, 7-6. If Williams wins, she could end up facing her sister, Venus Williams, in the third round. But Serena Williams wasn’t in the mood to look that far ahead Monday. “I’ve just got to play and hopefully get there,” she said. Venus, the No. 16 seed who has two US Open titles, had to play Svetlana Kuznetsova, the 2004 champion, in the first round, and needed 2 hours, 55 minutes to outslug Kuznetsova, a wild-card entrant from Russia, in steamy conditions. Williams finally emerged with a 6-3, 5-7, 6-3 victory. Venus faces No. 40 Camila Giorgi of Italy in her next match. A potential all-Williams meeting would take place Friday. Monday’s match was only Serena Williams’ fourth since she reached the Wimbledon final in July, losing to Angelique Kerber. She came on court wearing a black dress and a grim expression. Early on, she was plagued by some unforced errors, which have been more commonplace since her return to the tour. But by the second set she was firmly in control. She broke Linette in the first game and seemed to crush the younger player’s spirit, as well. Now, as a mother, she faces a more challenging task. Williams has discussed the guilt she sometimes feels when she leaves her daughter to go to work, but she said that she is starting to recognise the importance of pursuing her career and of allowing for moments to herself. That includes time spent playing tennis again under the lights in Arthur Ashe Stadium. “I think this is almost, in a weird way, kind of healthy,” she said. Meanwhile, Rafael Nadal has voiced support for Roland Garros chiefs who indicated they would institute a dress code at the French Open. French Tennis Federation president Bernard Giudicelli created an uproar when he said in comments reported in the French media that some outfits, such as Serenas “Black Panther” catsuit, wouldn’t be allowed. “I really believe that sometimes we have gone too far,” Giudicelli said. Williams herself downplayed any friction with Giudicelli on the issue. Nadal said that he saw no reason the tournament couldn’t limit what players wear, noting that Wimbledon did the same with its insistence on white. “I really believe when you have a tournament like Wimbledon that does what they want you cannot say to another event that they have to do another thing,” he said.